These days, it seems like we’ve become addicted to adding more and more to our already crammed schedules. In an effort to get the most out of our days, we spread ourselves thin between work, school, sports, social obligations, and all the while still try and find time to pursue individual goals and ambitions. The problem is that it leaves very little time for families to just focus on doing things together as a family, other than shopping trips or holiday dinners. Studies show that families who participate in activities together share closer and healthier relationships than those that neglect dedicated time with one another. This time spent together is helpful in establishing tighter bonds, experiencing shared family values, and the making of memories and traditions. Most families are aware of this need and so they have family game or movie nights, pizza nights, or annual vacations together. Slowly gathering steam however is the idea of family projects. 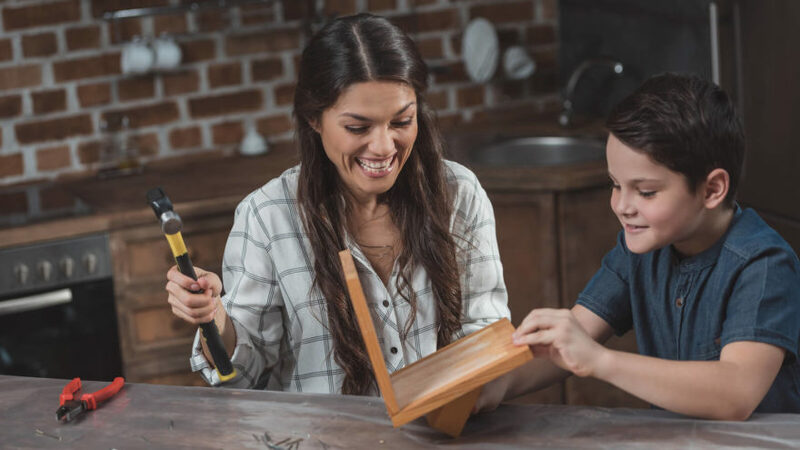 Family projects are a wonderful way for your family to not only spend time together, but also make your home, neighborhood, or community a little better in the process. When parents plan and organize fun projects to do as a family, they instill in their children the benefits of hard work, teamwork, cooperation, communication, and stewardship. They also share or learn new skills that help build their children’s confidence and sense of accomplishment; important things for young children to experience. While it may sound intimidating if you aren’t all that handy, family projects can be as cheap, easy, or novice level as you choose. The goal should always be to focus on spending productive and fun time together as a family rather than the end result of whatever undertaking you set your sights on. Stuck for ideas on a good beginner family project? We’ve got you covered. A family garden has so many benefits that it deserves a top spot on the list. More than just a one-time project that the family can do together, gardens require (or provide, if you’re an optimistic), year-round care and attention. They’re also surprisingly easy to make in any size that suits your yard space and skill level. Even if you have no yard whatsoever, window box gardens are a great way to get your children their first taste of a green thumb and provide the family with some fresh fruits, vegetables, or herbs and spices. Stop by your local greenhouse and talk to the folks there about just what flora would be best for your family and they can even fill you in on just how to care for your plants. It’s always interesting to see all of the different types of birds that can life in our backyard. The problem is that they usually hang out up in the trees or on the power lines, just out of reach for a good view. By building some bird feeders together you can bring those birds down a little lower and enjoy having some wildlife in your yard that the whole family will enjoy. If you want to go the easier route, just cover some pinecones in peanut butter and roll in a pile of birdseed. Then hang these up around the yard for cheap and easy feeders. What backyard would be complete without a tire swing hanging from the big tree? Not only is it a great to re-purpose at least one old tire, the kids will enjoy swinging in this time-honored classic for years. If you’re not too keen on the look of an old tire hanging in your yard, get the kids involved in painting the tire with fun designs or pictures to add a bit of charm to the swing. Near and dear to my heart are our country’s watersheds. The beaches and larger rivers might get all of the limelight, but that doesn’t make the small creeks any less important for their contribution to a clean and healthy ecosystem. You probably even have a small creek somewhere around your house. You can invest in some trash bags, gloves, and boots and spend an afternoon cleaning up the trash and liter of one of these little water gems. Just consider the size of your children when it comes to being around any body of water and take necessary safety precautions for the water and any trash they might come into contact with. If your family is like ours, there’s probably more than a few things laying around the house that no longer serve a purpose. Either clothes that no longer fit, toys that are no longer played with, kitchen appliances that seemed like a good idea at the time, or anything else taking up space, one man’s junk is another man’s treasure. A great way to encourage your children to not only recycle their old clothes and toys, but also share the joy of providing less fortunate people with things that they would appreciate, spending a day rounding up all of the things that you don’t need any more and donating it can be a fun activity for your family to do together. Requiring less long-term work than a garden, a flower bed is easy to do and can help add some bright color to a boring piece of property. Again, doing some research ahead of time or talking to your local greenhouse can ensure that you get the right types of flowers and plants for your soil, sunlight, rain frequency, and personal tastes. The added bonus is that if your children are involved in the process of planting a flower bed, it’s much easier to convince them to pitch in pulling weeds as the months go by. Now that you built that garden or planted that flower bed, keeping a steady supply of nutrient rich soil is going to be a priority. One of the most economical and earth-friendly ways to do this is with compost. These backyard collection points for organic matter also help reduce the amount of waste you’re sending off to the dump. You can make one as elaborate or simple as you’d like. Ours has always been a simple circular pit of chicken wire held up with garden stakes. Inside, we toss our egg shells, fruit and vegetable byproducts, garden clippings, and any other organic, biodegradable matter. After a while of adding and stirring this organic waste, you end up with a great fertilized to mix into the soil that helps plants grow strong and healthy. It doesn’t necessarily need to be a “party” area. It can be a spot to enjoy a small fire, a BBQ, or just a place for the family to enjoy the outdoors. Getting the whole family involved in the various ideas will really make it feel like an inclusive and welcome area for everyone. Like most projects, this one can be as big or as small as you’d like it to be depending on the space available or the things your family likes to do. Maybe a little less of a “project”, volunteering together as a family is still a great way to bond and develop family values. You can spend your volunteer time at animal shelters, soup kitchens, children’s homes, or anywhere else that could use a helping hand. Most of these places have things that need done for just about anyone’s skill level, so don’t be afraid of your previous experience level. It really isn’t important what type of projects you choose to do together as a family, all that matters is that you experience new things together and in a fun way. If your family already has some common interests, explore ways to enjoy those interests together whether it’s with a family craft or project that reflects your common hobbies. There’s always going to be chances to focus on developing your children individually or work on your own personal aspirations and growth, but family projects allow the entire family to grow together. So, get creative, roll up your sleeves, and get out and make some memories!